I discovered that I am not alone in my rant. Pozuelo is up in arms about the forest near my house that I cycle through on my way to work!! How exciting in a suburban, middle class kind of way. There was a demonstration on Saturday that I was unaware of otherwise I would definitely have attended. The problem is that the land is owned by an extremely rich, influential and slightly scary Spanish family (maybe it's just me, but "The Legionaries of Christ" makes me think of bad 70s horror films). The Oriols - who made their fortune in the energy business, now Iberdrola - have recently decided, after years of it being open to public use, to fence most of it off, leaving only one path through the forest. Apart from destroying the feeling of being out in the open, the "path" is so badly eroded from the security cars patrolling up and down that, when it rains, the puddles extend from one fence to another, leaving no option but to get off your bike and wade through the water. From a legal point of view, it seems hard to challenge them, especially as they have left a public right of way. Also they have a tangible reason for putting up the fence: to prevent damage to their grounds now evidenced, unfortunately, by people having torn down the very same fence (it wasn't me, honest!). The worrying thing is that it looks as though they might be planning to develop something on that land. After all the backhanders to re-qualify agricultural land as suitable for urbanization and its corresponding contribution to the Spanish housing bubble, I sincerely hope that the politicians have more sense now than to grant them planning permission. It looks like this could be a clincher for the municipal elections next Sunday. On the one hand, we have Tomás Gómez (PSOE) who promises to be the "President for the Common People" and who poses on his pre-election poster gazing skyward, perhaps wondering if God will remember to vote for him; on the other, we have the Partido Popular (PP), which has the same slogan "Focused on you" underlining everyone's photo, except that of one person. His name? Narciso (Narcissus). 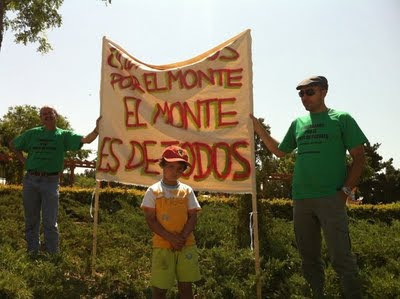 Anyway, if you happen to care about my little forest, you can "like" the cause on Facebook: it is called "Monte de Pozuelo - Monte para todos".